It’s an Asian thing. 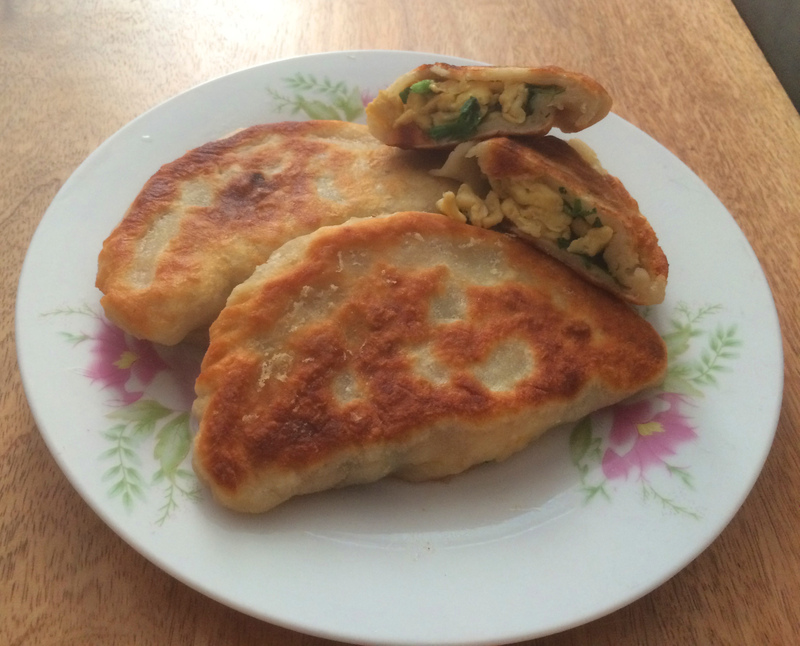 And what’s weird is that egg and chive pockets weren’t a huge favorite of mine growing up, but one morning I had a major craving for them. Certain things just remind you of home, I guess. 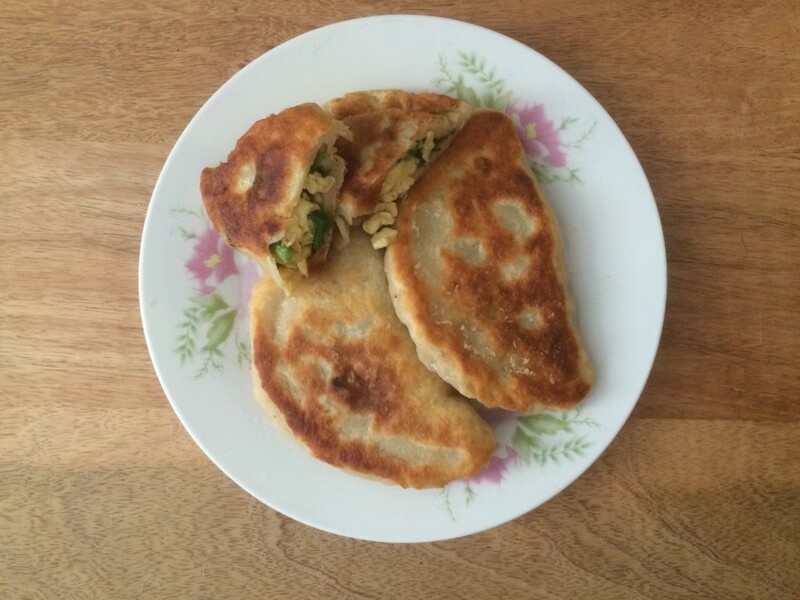 My grandmother made them on the bigger side, think along the lines of the size of half of a dinner plate. I on the other hand, didn’t feel capable of pulling that off since I had never made them before. So I went the small pocket route and they were delicious. Since I was winging it, I didn’t write down any measurements, but you can still get the gist of what I did and create yours at home. Super easy by the way. Put all-purpose flour in a bowl and mix with hot water. I use a chopstick until the water cools down a bit, and then knead with my hands. Combine until the dough comes together, is moldable, and only slightly sticky to the touch. Let the dough rest for 15 minutes. While that’s resting, scramble eggs in a bowl with sesame oil and soy sauce. Cook scrambled eggs. 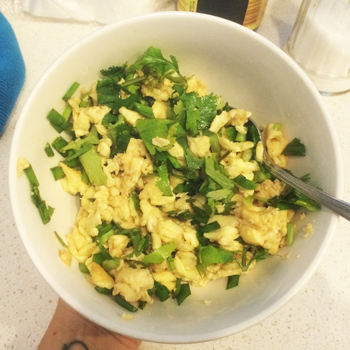 Mix eggs with chopped Chinese chives and cilantro. Cilantro is optional, I just felt like eating it that day. Divide the dough up to a handful for each pocket. Only use enough so that when you roll them out (across a floured surface), the diameter is around 6 inches or so. Roll it out thin, but not thin enough so that it isn’t strong enough to hold in the filling. Think along the lines of empanada thick. Fold the dough closed so that it looks like a half moon. Close the dough by pressing down and then doing mini folds. Heat a few TBS of canola oil in a pan over medium-high heat. Place the pockets in the pan. When the bottom is browned, flip and cook till that side is browned as well.